Healthcare plastic waste. We all have it. Heaping piles of it. But what do we do with it? What will the recycler take? How can contamination be avoided? How does the facility collect, transport, store, and market its materials? Join Practice Greenhealth and the Health Care Plastics Recycling Council for a repeat of their sold-out CleanMed 2017 Pre conference. Hear the latest from both Practice Greenhealth and HPRC around data, initiatives and learning opportunities. Perspectives will be shared from Gundersen Health System, HealthPartners and Mayo Clinic. Down in the weed activities around bin placement, signage, training, storage and other challenges will be discussed. Bring your team and bring your questions. 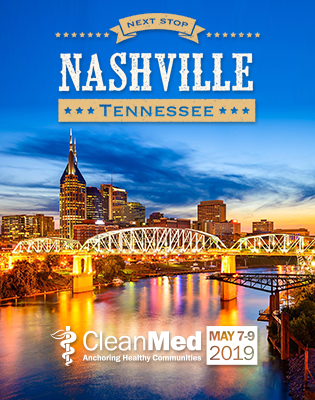 Hear lessons learned for maximum medical plastic recovery including from the operating room and other patient care areas. Janet Howard leads the facility member engagement team and the Healthier Hospitals program. The team provides fresh content, educational support and technical assistance to Practice Greenhealth facility members and Healthier Hospitals enrollees. Recent projects include the Employee Engagement Toolkit and fresh content on Materials/Wastes, Engaged Leadership and the new Less Food to Landfill goal and toolkit. The Member Engagement team works together to help organizations recognize the link between sustainability programming and quality, patient experience and performance excellence. Janet's angle is around empowerment and the belief that every person deserves a safe, healthy and respectful environment. Janet pioneered sustainability in health care from 1991-2004 for Continuum Health Partners in New York City. She is a frequent writer on health care sustainability issues for outlets like Greenbiz, CSR Wire and Health Care Design Magazine. You can read Janet's columns on her LinkedIn profile. Peylina Chu is a master at helping companies manage the business aspects of environment, health, safety, and sustainability (EHS&S). Recognizing that EHS&S management is much more than just compliance, and that EH&S issues have the potential to seriously disrupt business, Peylina develops customized programs for clients that are proactive, tailored to company-specific risk tolerance levels, and incorporated into company culture from the C-suite to the hourly employee. With her 20+ years of experience, Peylina understands that in addition to traditional regulatory drivers, today's companies must meet public and customer expectations, investor concerns, and non-governmental organization demands. Peylina is a Registered Professional Engineer and serves as Director for the Healthcare Plastics Recycling Council (www.hprc.org) and on the Board of Directors for the Inogen Environmental Alliance (www.inogenet.com), an alliance of global EHS and sustainability consultants. Andy is the Environmental Compliance Tech at Gundersen Health System. He assists in the proper handling and disposal of waste including: solid waste, infectious waste, pharmaceutical waste, electronic waste, and recyclable material. He has been with Gundersen Health System going on 2 years. He has a Bachelor’s Degree in Biology from the University of Wisconsin – La Crosse. Glen was born and raised on his family farm south of Rochester MN. He started working at Mayo Clinic in 1985 for the Facilities department. After leaving Mayo Clinic, Glen started a waste management and application recycling company. After co-owning the company with his brother for 10 years, Glen returned to Mayo Clinic in 2007 and has since been an important member of the Recycling team there. As Waste and Recycling Education Coordinator for Mayo Clinic, Angie Dalenberg coordinates and executes educational efforts for all waste and recycling streams with staff of all disciplines. Angie provides feedback to generators via waste and recycling audits and participates in institutional and departmental committees and work teams. In particular, Angie enjoys deploying plastics recycling in new locations and discussing with staff how improvements to their practices have positive compliance, safety and environmental impacts. Samantha McKeough is the Sustainability Coordinator for HealthPartners. In this role, Samantha is responsible for implementing HealthPartners comprehensive set of sustainability programs. She is also responsible for co-leading several of the organization’s green teams and is a member of other sustainability working groups across the enterprise. Prior to joining HealthPartners, Samantha worked for two years in environmental services, health, and safety for Saint Paul Public Schools. Through these roles she has gained experience managing large data sets, collaborating with a variety of personnel to achieve complex goals, and communicating progress towards those goals to stakeholders. She graduated from the University of Wisconsin – Madison, where she earned a degree in Environmental Studies as well as a degree is International Studies. She is an active participant in several professional workgroups and is a board member for the Women’s Environmental Network.